Classic TV can be scary! That is, if you're talking about some of the chilling made-for-TV movies of the 1970s (e.g., Trilogy of Terror, The Night Stalker), classic horror series like Thriller, or Halloween episodes of non-horror shows like Route 66. This Halloween, the Classic TV Blog Association is hosting a members-only blogathon devoted to Terror TV. It's frightening just thinking about it! Of course, there are also some very funny Halloween episodes of classic series to lighten the mood. 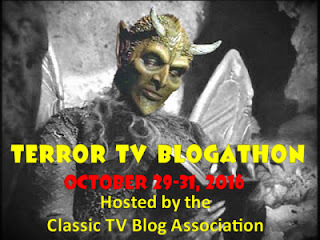 If you want to join the Classic TV Blog Association, it's easy and you'll meet (virtually) some fabulous--and knowledgeable--TV fans. Click here for details. Read the guidelines to make sure your blog qualifies. Then, send an e-mail with your blog's web address to: classic.tv.blog.assoc@gmail.com.